Last analysis on the 7th of February advised that a sideways consolidation was expected to continue. Price remains range bound. Summary: For the short term, the consolidation may end soon. The next move for Bitcoin is expected to be very strong with a downwards breakout, ending reasonably below 3,169.53. Only a new high above 7,234.83 would change this view. If this current drop continues like the last two examples, then a reasonable target may be about $1,390.94 or below. An Elliott channel is added to downwards movement. Upwards bounces may find resistance about the upper edge. Primary wave 2 may now be a complete double combination: zigzag – X – flat. 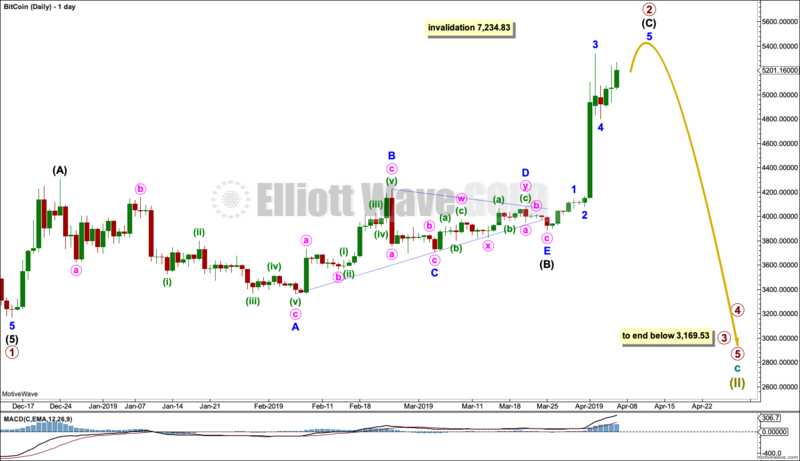 Primary wave 2 has so far remained within the teal Elliott channel, which is copied over from the weekly chart. 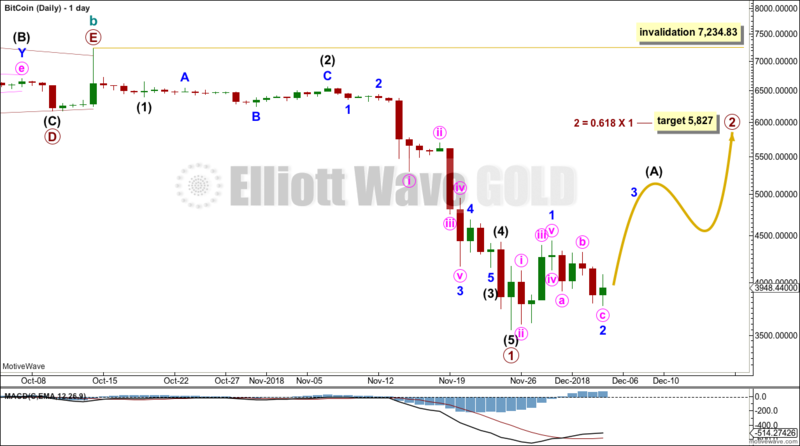 If primary wave 2 continues any higher, then it may not move beyond the start of primary wave 1 above 7,234.83. A breach of the black Elliott channel by a full daily candlestick below and not touching the lower edge would add confidence to this main wave count. 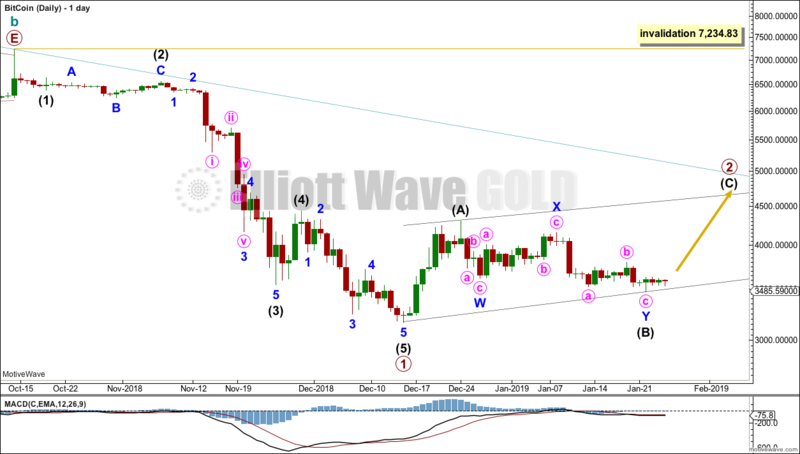 At that stage, the invalidation point may be moved to the end of primary wave 2. 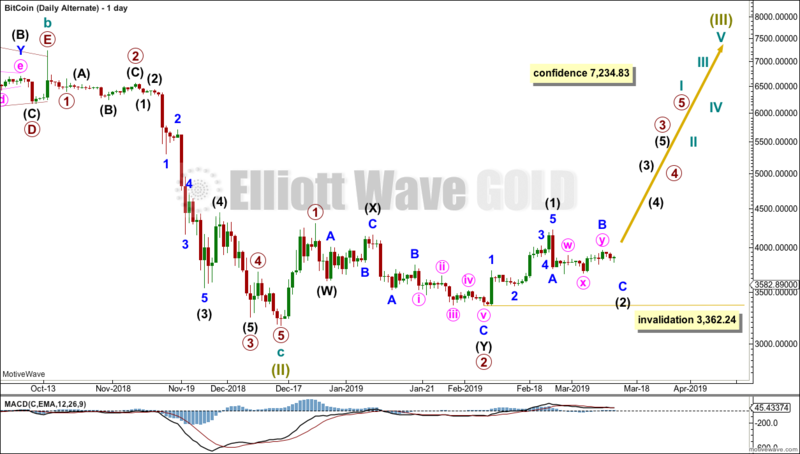 A new low below 3,362.24 would add further confidence to this wave count. Primary wave 3 should exhibit an increase in downwards momentum. If the teal Elliott channel is breached by a full daily candlestick above and not touching the trend line, then the alternate wave count below should be seriously considered. This wave count expects that the crash in price for Bitcoin was only 84% of value from the all time high. While this is possible, it would not follow the more common pattern of Bitcoin to crash over 90% in value. This must reduce the probability of this wave count. If this wave count is correct, then an increase in upwards momentum would be expected as a third wave at two degrees unfolds. 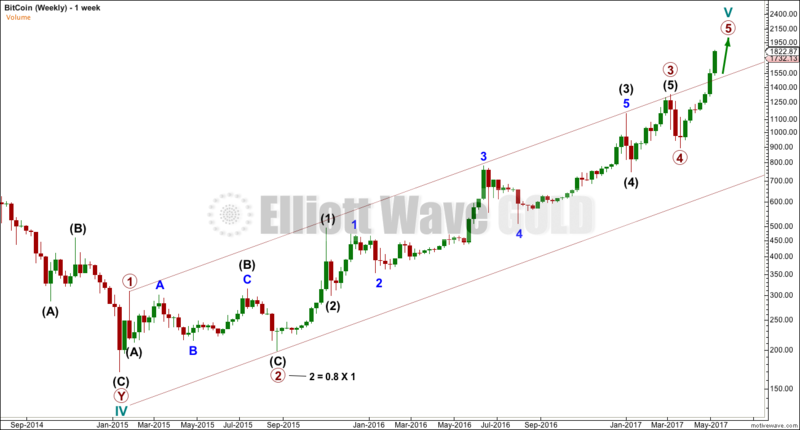 Intermediate wave (2) may not move beyond the start of intermediate wave (1) below 3,362.24. Currently, price is range bound with resistance and support identified. On Balance Volume is again range bound. Wait for a classic breakout. An upwards breakout of price requires support from volume for confidence, but a downwards breakout does not. 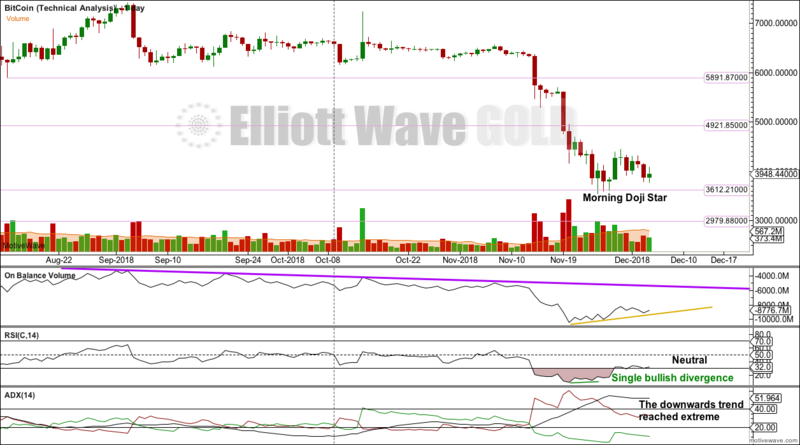 On Balance Volume broke out before price and exhibits bullish divergence with price. This supports the alternate Elliott wave count. Published @ 01:42 a.m. EST. 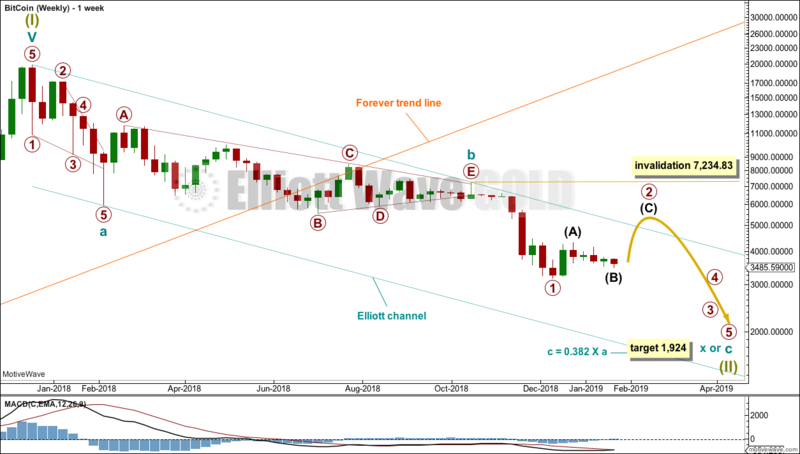 Last analysis on the 14th of December advised that a channel should be used to indicate when downwards movement was over and a sideways consolidation or bounce may have begun. 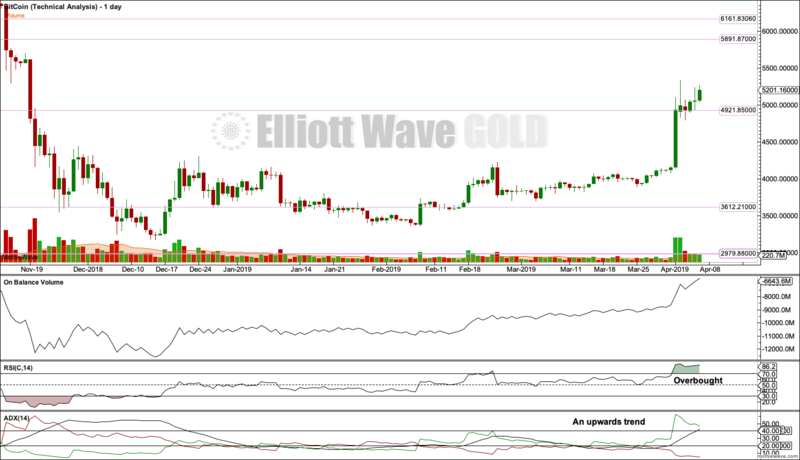 The channel was breached on the 19th of December and price has mostly moved sideways since. Summary: For the short term, this sideways consolidation may continue and may find a high about 4,722. Thereafter, another strong fall in price is expected. It would be safest to assume that the bear market will continue while Bitcoin remains below 7,234.83. The target is about 1,924, but it may be much lower than this; it is possible this bear market may see the end of Bitcoin. Primary wave 2 would most likely subdivide as a zigzag. So far, within primary wave 2, intermediate waves (A) and (B) may be complete. 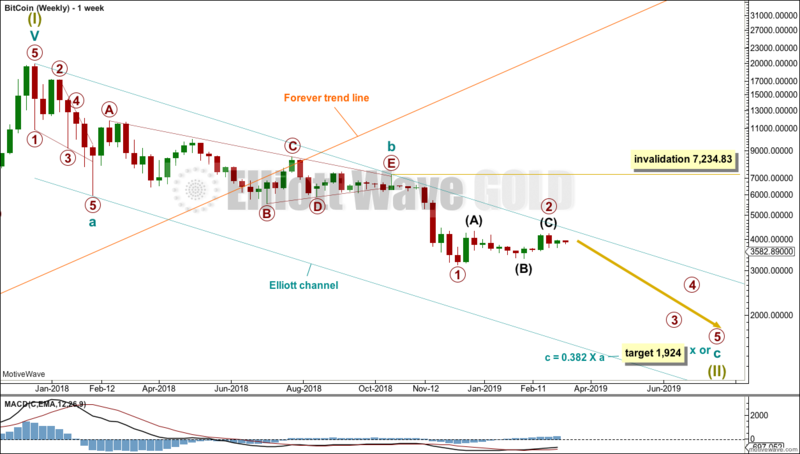 Intermediate wave (C) may end about the upper edge of the black Elliott channel drawn about primary wave 2. This may also be where upwards movement may find resistance at the teal channel copied over from the weekly chart. When primary wave 2 may be complete, then primary wave 3 should exhibit an increase in downwards momentum. So far at the lowest low from the all time high Bitcoin has only retraced 0.84. While this is deep, its corrections are usually deeper than this. Currently, price is range bound with resistance and support identified by cyan trend lines about 4,300 and 3,170. 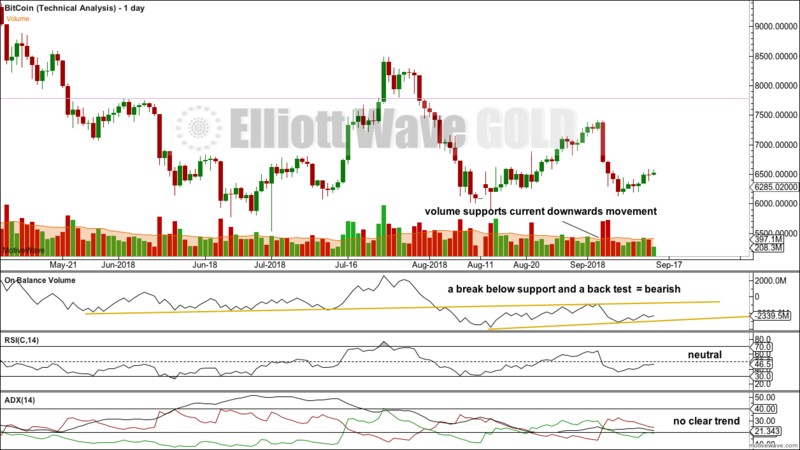 On Balance Volume is also range bound. Wait for a classic breakout. 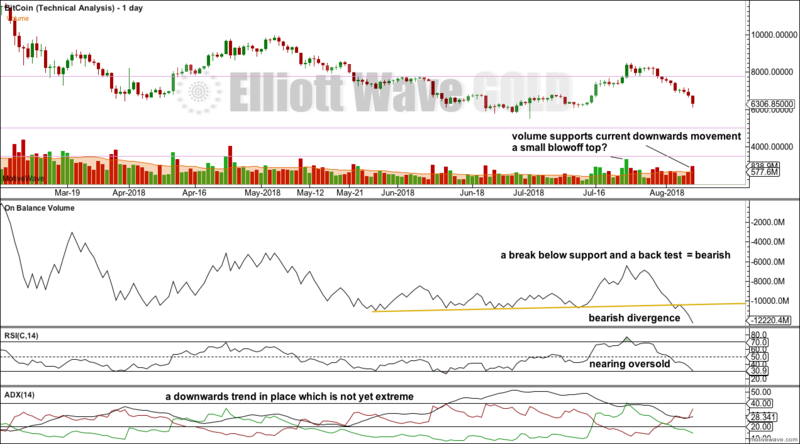 An upwards breakout of price requires support from volume for confidence, but a downwards breakout does not. 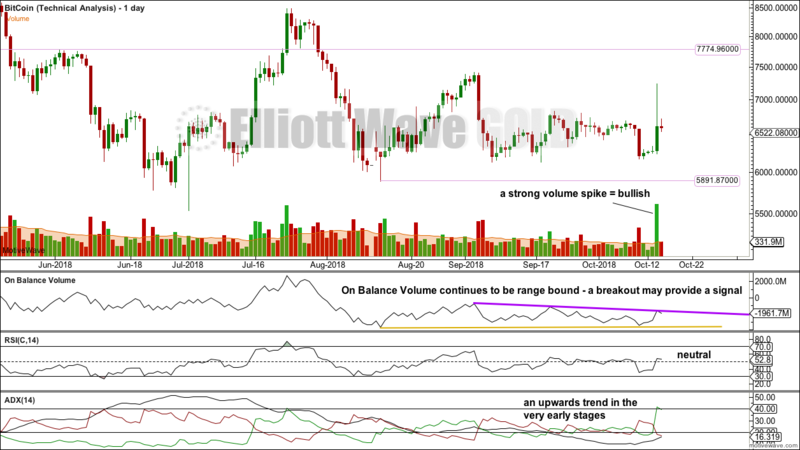 If On Balance Volume breaks out before price, it may signal the direction of a price breakout to follow. Published @ 11:41 p.m. EST. Last analysis on the 6th of December expected some sideways movement, which is what has happened. Summary: Use the channel on the main daily chart. Assume more downwards movement while price remains within the channel. When the channel is breached, then assume a multi-month bounce or consolidation may begin that should remain below 7,234.83. Last analysis may be found here. I am unable to find reasonable Fibonacci ratios within this wave count. It appears that Bitcoin may not exhibit Fibonacci ratios very often between its waves, so this makes target calculation impossible. Classic technical analysis was used to identify a high in place on the 23rd of December, 2017. Confidence that Bitcoin was most likely crashing started since the Forever trend line was breached in June. 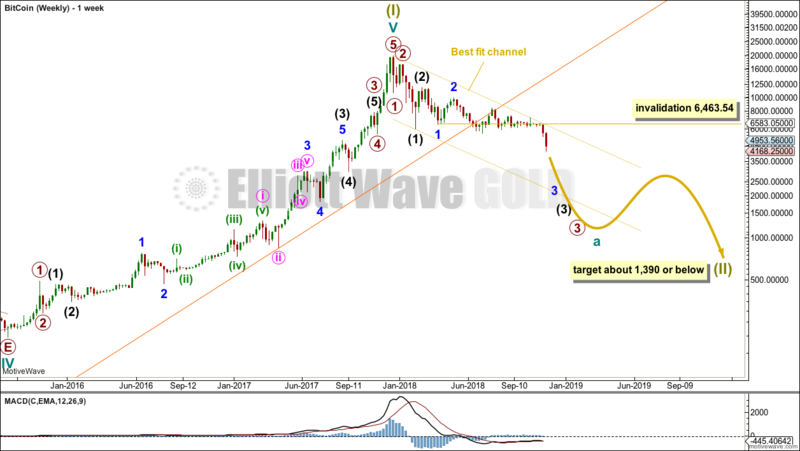 The target calculated expects cycle wave c to exhibit a Fibonacci ratio to cycle wave a. Bitcoin rarely exhibits Fibonacci ratios, so this target does not have a good probability. Within cycle wave c, primary wave 1 may be incomplete. Unfortunately, Bitcoin rarely exhibits Fibonacci ratios in its actionary waves. Therefore, it is impossible to calculate a target. A best fit trend channel is drawn on the chart. 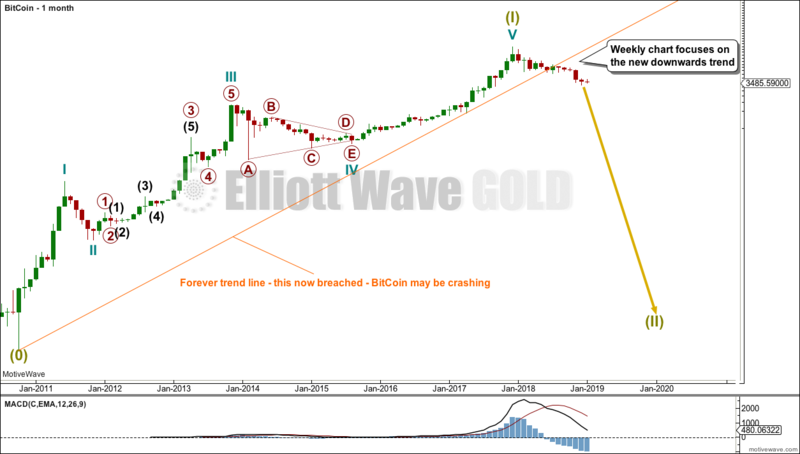 An upwards breach of the channel would indicate that primary wave 1 should be over and then primary wave 2 should be underway. Primary wave 2 may be subdividing as an expanded flat. Two targets are calculated at two different wave degrees. Primary wave 1 lasted 41 sessions. 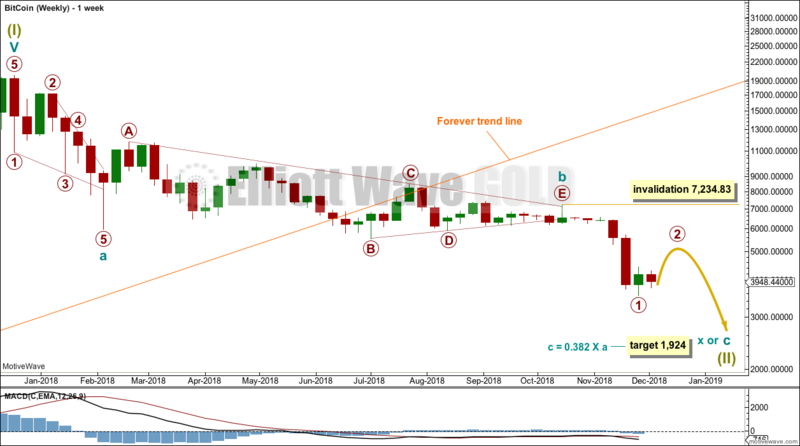 Primary wave 2 may last about two to three months to have reasonable proportion to primary wave 1. 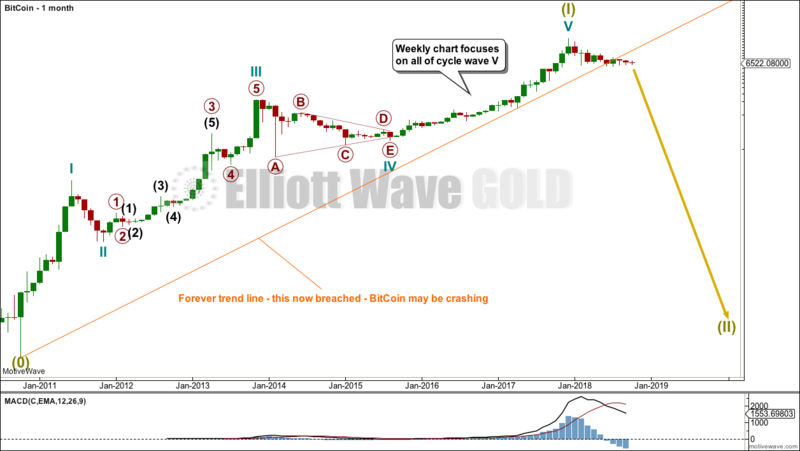 By moving the degree of labelling within cycle wave c up one degree, it is possible that the crash for Bitcoin could be over. This alternate wave count has changed since the last published analysis. It now sees Super Cycle II over at the last low. This wave count has a very low probability. It does not follow normal behaviour for Bitcoin. Normal behaviour for an early second wave correction is for Bitcoin to retrace deeper than 90% of the first wave. This wave count expects that Super Cycle wave (II) was only 84%. While this is very deep, it is not as deep as is normal for Bitcoin. A candlestick reversal pattern at the low of Super Cycle wave (II) would be fairly likely at the weekly chart level which is not the case at this time. For the short term, expect more downwards movement as likely. This is supported by volume. Downwards days have greater support from volume in recent movement. Published @ 04:56 a.m. EST. Last analysis on the 21st of November expected more downwards movement for Bitcoin, which is what has happened. Summary: At this stage, Bitcoin may either bounce up to about 5,827 or move sideways. The bounce or consolidation may last about two to three months. Within cycle wave c, primary wave 1 may be complete. Primary wave 2 would most likely subdivide as a zigzag and may end about the 0.618 Fibonacci ratio of primary wave 1. Normal behaviour for an early second wave correction is for Bitcoin to retrace deeper than 90% of the first wave. This wave count expects that Super Cycle wave (II) was only 82%. While this is very deep, it is not as deep as is normal for Bitcoin. A candlestick reversal pattern at the low of Super Cycle wave (II) would be fairly likely at the weekly chart level and not only the daily chart, which is not the case at this time. So far at the lowest low from the all time high Bitcoin has only retraced 0.82. While this is deep, its corrections are usually deeper than this. 1. On the 26th, 27th and 28th of November a Morning Doji Star unfolded. 2. 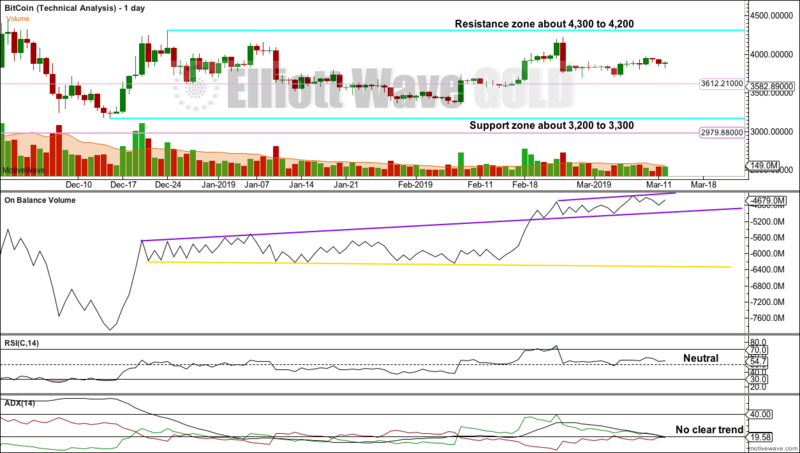 RSI reached deeply oversold and there exhibited bullish divergence with price. 3. The short-term volume profile is bullish. 4. ADX reached very extreme and is now declining. Support is identified on the chart. Published @ 02:02 a.m. EST. 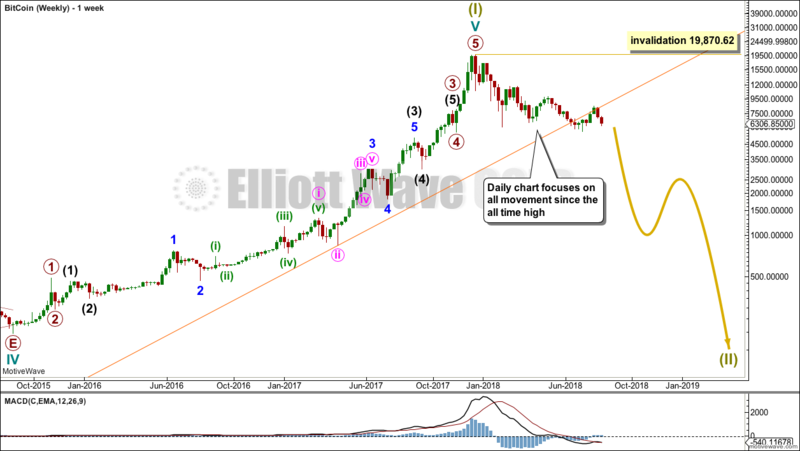 The first preferred Elliott wave count expected Bitcoin to exhibit an increase in downwards momentum. This is exactly what is happening. 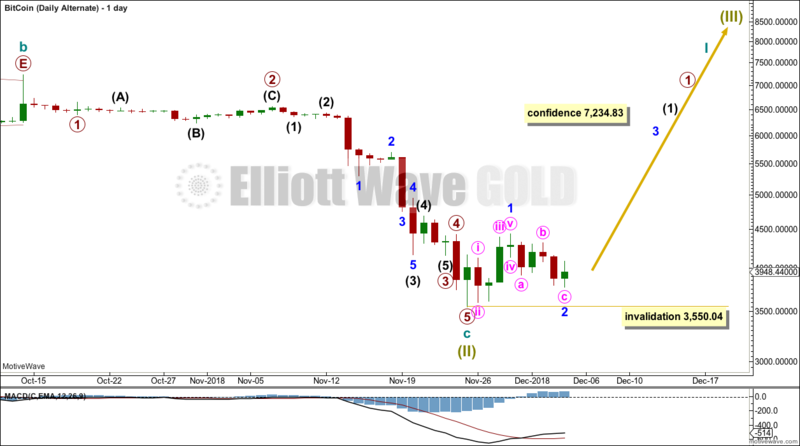 The second Elliott wave count was invalidated seven days ago. 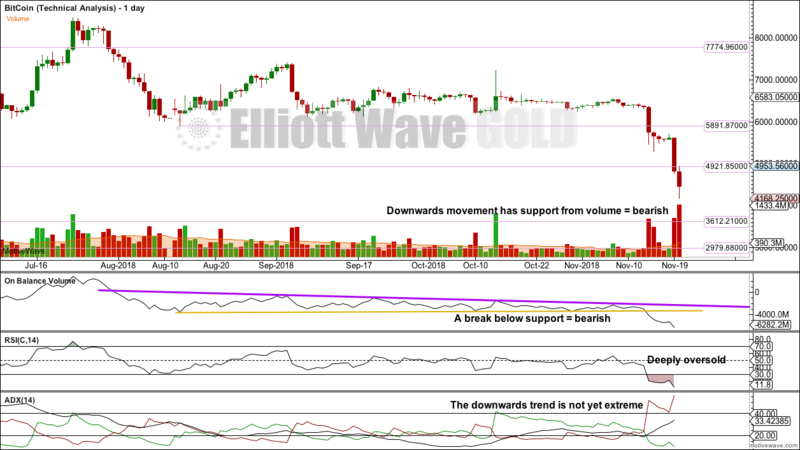 Summary: Downwards movement has push from rising volume. This is very bearish. Expect downwards movement to continue until there is a bullish candlestick reversal signal on the daily chart. Next support below is at 3,612 and 2,980. 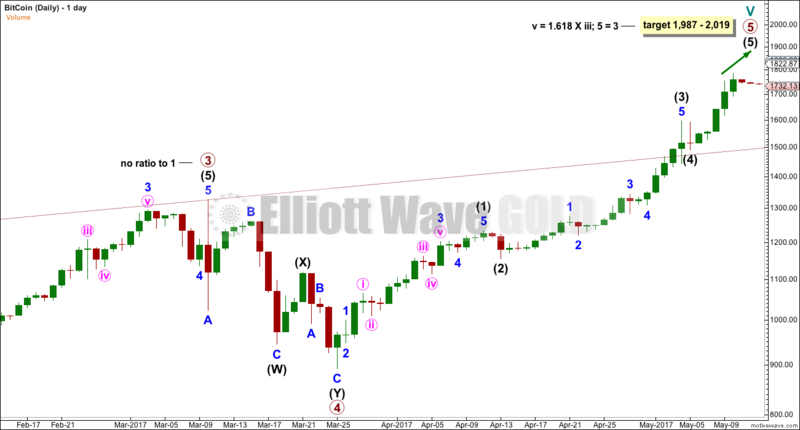 I cannot at this time yet see a completed corrective Elliott wave structure for this downwards movement, so I expect it is incomplete. Now that the Forever trend line is breached some confidence may be had that Bitcoin may be crashing. Super Cycle wave (II) would most likely be a zigzag, but it may also be a flat, combination or triangle; a zigzag would subdivide 5-3-5. Cycle wave a should subdivide as a five wave structure, but so far that would be incomplete. Within this five wave structure unfolding lower, minor wave 3 may now have moved through its middle. Minor wave 4 may not move back up into minor wave 1 price territory above 6,463.54. 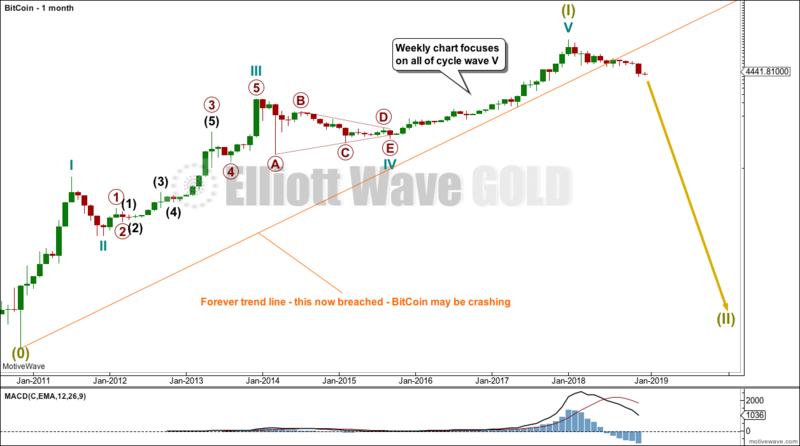 When cycle wave a may be seen as complete, then a one to multi-year bounce or consolidation for cycle wave b may be expected. 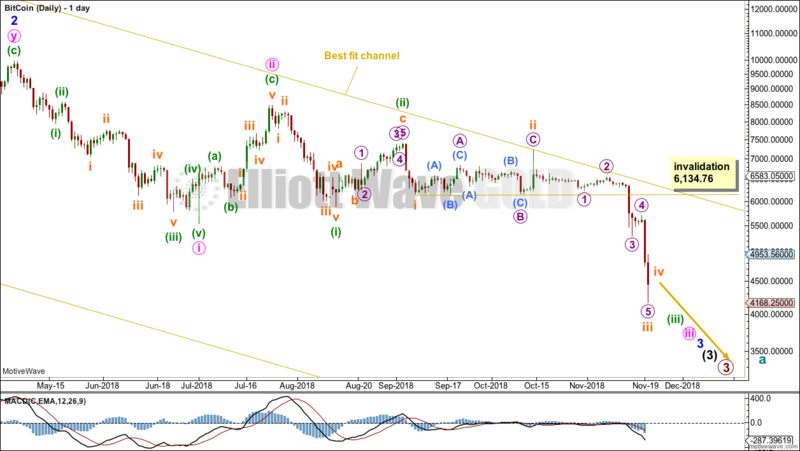 This may present a weak buying opportunity, but the huge variation in structure of b waves makes this extremely risky. If Bitcoin is crashing, then a five down structure should develop at the weekly chart level. This would still be incomplete. A third wave down may now be moving through its middle at six degrees. Bitcoin may be still winding up for a further spectacular plummet in price. The strongest fall may come towards the end of any one or more of these third waves as Bitcoin exhibits commodity like behaviour. Commodities tend to have their strongest portion of impulses in the fifth waves. 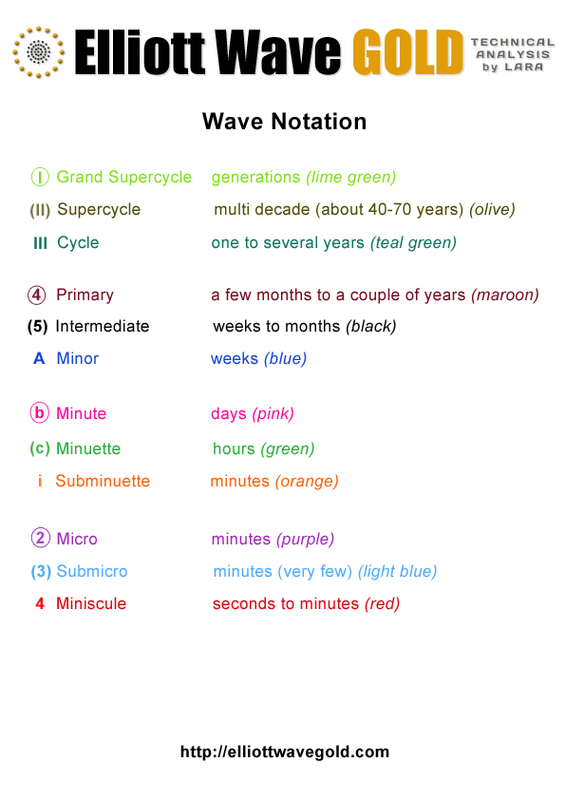 Within the middle of this third wave, subminuette wave iii may be either complete or close to complete. Subminuette wave iv may not move into subminuette wave i price territory above 6,134.76. Only when a clear bullish reversal pattern forms on the daily chart would a more time consuming bounce or consolidation be expected to interrupt this downwards trend. Today that is not present, so it seems more reasonable to expect this downwards movement to continue. For the short term, support from volume is pushing price lower. This is very bearish. 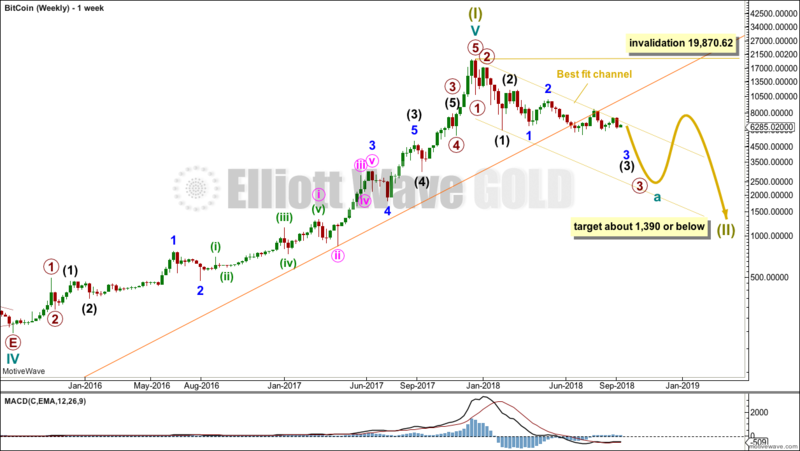 For the current fall in price, the current Elliott wave count expects the fall to be larger in terms of duration than the previous two noted here, and at least equivalent in terms of price movement in that a fall of over 90% is expected now. Currently, ADX is not yet extreme. RSI is now deeply oversold, but past behaviour indicates this may continue for some time. There is plenty of room for this downwards trend in Bitcoin to continue. So far at the lowest low from the all time high Bitcoin has only retraced 0.79. While this is deep, its corrections are usually deeper than this. Support below is identified on the chart. Published @ 05:23 a.m. EST. Bitcoin continues to move sideways and remains range bound. Summary: A clear breach of a support line, which has seen all price action above it until this point, is a strong indication that Bitcoin is bearish. Now that a backtest about the support line is complete, price may be expected to continue to move downwards from this line. 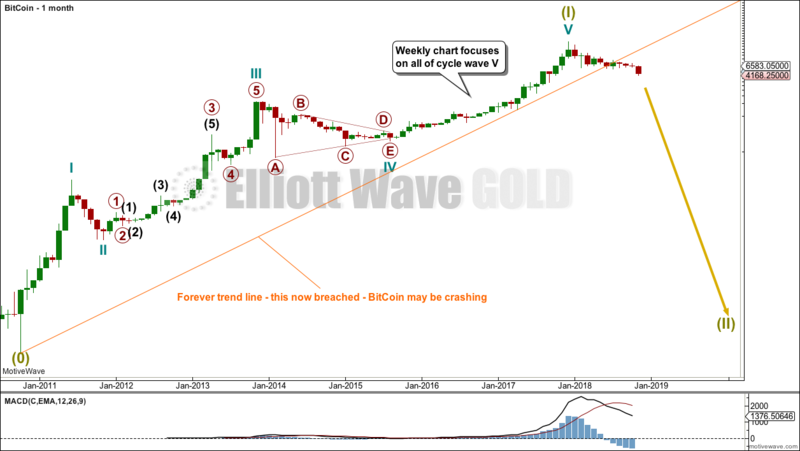 At this time, Bitcoin may be in the early stages of a third wave down at six degrees. 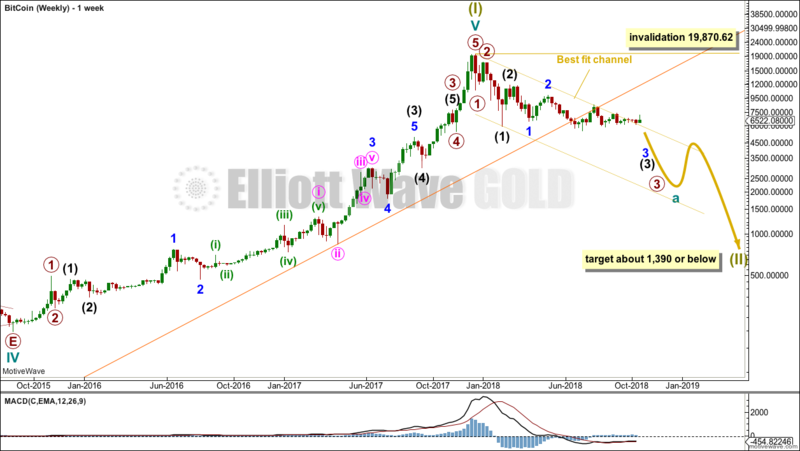 A new alternate Elliott wave count is published today which allows for a large bounce here before a continuation of downwards movement to new lows. If Bitcoin is in the early stages of a huge crash, then a five down structure should develop at the weekly chart level. This would still be incomplete. A third wave down may now be beginning at six degrees. Bitcoin may be still winding up for a spectacular plummet in price. The strongest fall may come towards the end of any one or more of these third waves as Bitcoin exhibits commodity like behaviour. Commodities tend to have their strongest portion of impulses in the fifth waves. The best fit channel has only weak technical significance and is now breached. The Forever trend line is not perfectly showing where price found support and has then found resistance for a typical back test. However, it is about where price found support and resistance. The breach and back test are highly significant. I have searched to find if a five down could be seen as complete. At this time, I cannot yet see either a complete impulse or a leading diagonal. It is also possible that Bitcoin may move lower as a flat correction, double combination or a double zigzag. 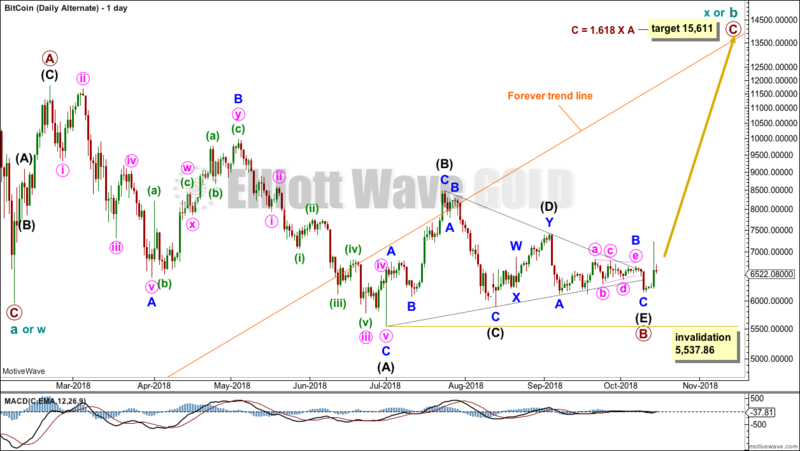 Within a flat correction, cycle wave a may have completed as a zigzag. 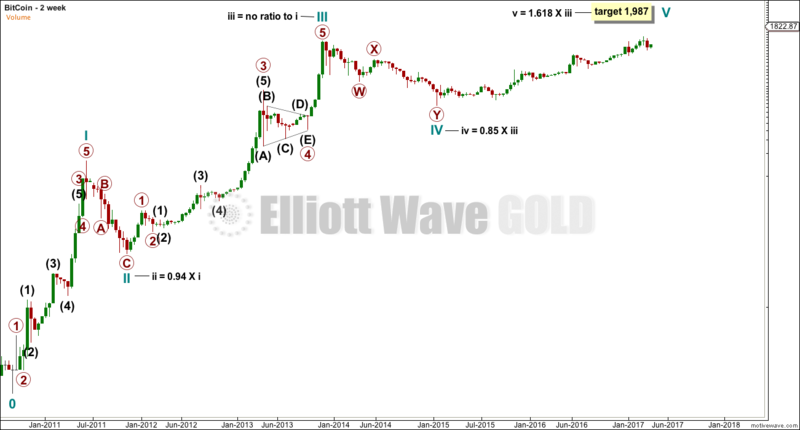 Cycle wave b would need to move higher to retrace a minimum 0.9 length of cycle wave a at 18,480. Cycle wave b would need to subdivide as a corrective structure, most likely a zigzag. Cycle wave b within a flat correction may make a new price extreme beyond the start of cycle wave a. 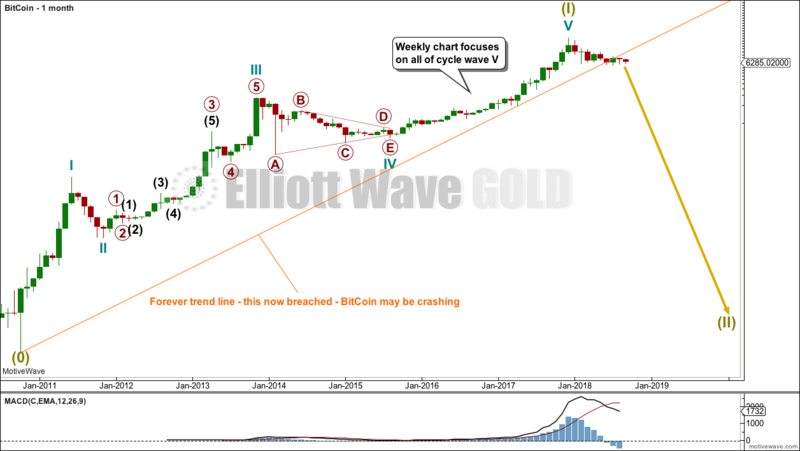 Within a double zigzag, cycle wave w may be the first zigzag complete. Cycle wave x would have no minimum nor maximum required length to cycle wave w; it only needs to complete as a corrective structure, which would most likely be a zigzag. X waves within double zigzags are usually shallow, so that the whole structure has a strong slope. 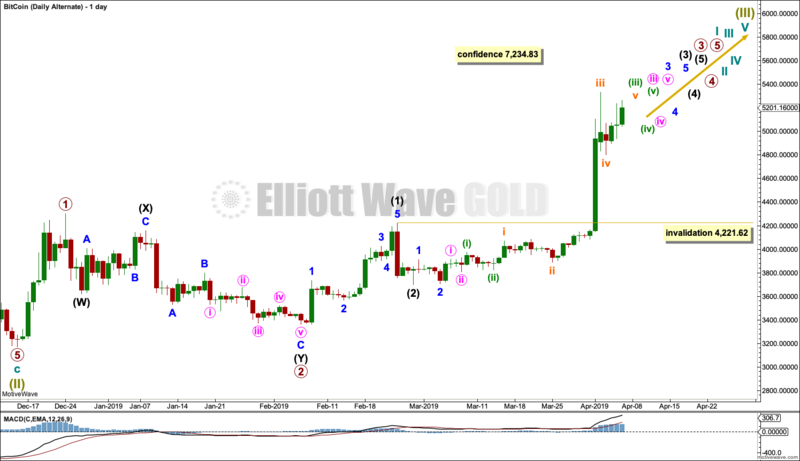 Within a double combination, cycle wave w may be the first complete structure as a zigzag. Cycle wave x would have no minimum nor maximum required length to cycle wave w; it only needs to complete as a corrective structure, which would most likely be a zigzag. X waves within combinations are usually deep, so that the whole structure has a sideways look. 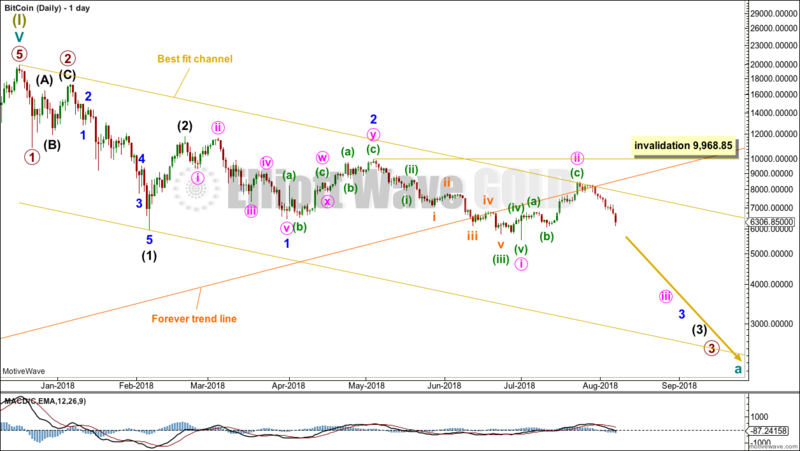 Cycle wave x within a combination may make a new price extreme beyond the start of cycle wave w.
A second wave may not subdivide as a triangle with its sole corrective structure, so a triangle for this correction is not considered. 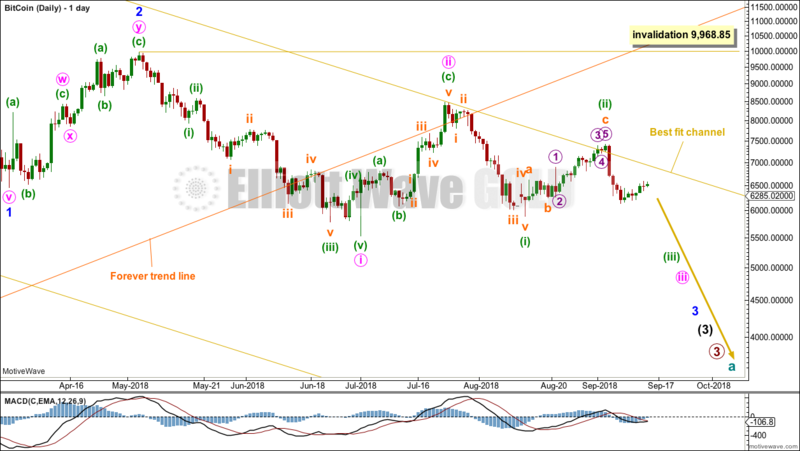 The daily chart focusses on the whole of cycle wave b or x so far. Cycle wave b or x may be unfolding as a regular flat correction, and within it primary wave A fits as a three and primary wave B also fits as a corrective structure. Primary wave B effects a net 0.965 re-tracement of primary wave A at its end. This meets the minimum requirement of 0.9 for B waves within flat corrections. A target is calculated for primary wave C to end. However, because Bitcoin does not exhibit reliable Fibonacci ratios this target is a rough guideline only. A better guide may be resistance about the orange forever trend line. Volume is declining (at higher time frames); this market is falling mostly of its own weight. However, looking more closely, daily volume is stronger for downwards days than for upwards days. 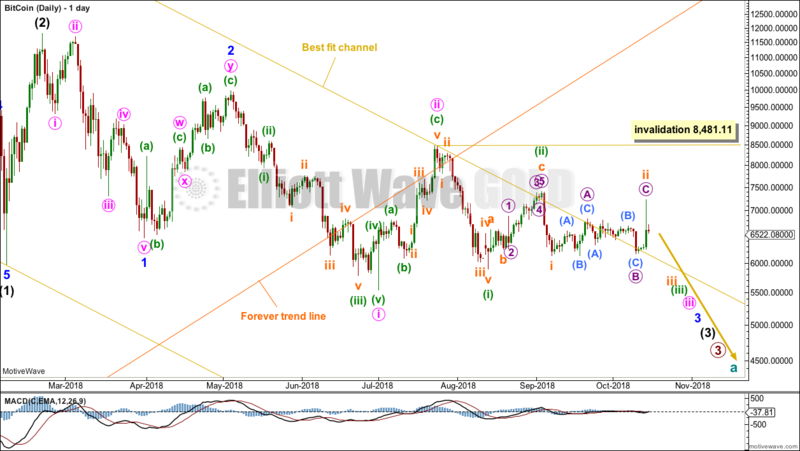 For the current fall in price, the current Elliott wave count expects the fall to be larger in terms of duration than the previous two noted here, and at least equivalent in terms of price movement in that a fall of over 90% is expected now. Currently, ADX is not yet extreme and RSI is not yet oversold. There is plenty of room for this downwards trend in Bitcoin to continue. So far at the lowest low from the all time high Bitcoin has only retraced 0.70. While this is deep, its corrections are usually deeper than this. On Balance Volume and price remain range bound. Price has resistance about 7,775 and support about 5,890. Watch both closely to see a breakout. Published @ 03:21 p.m. EST. Bitcoin continues to move mostly sideways, with a slight downwards bias. 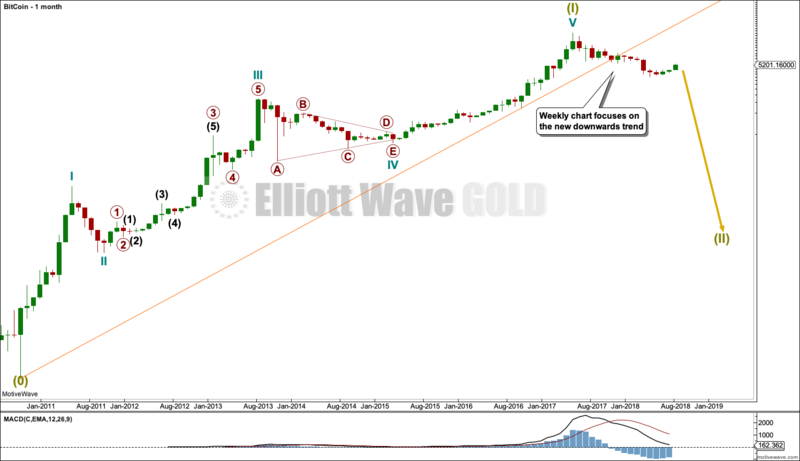 At this time, Bitcoin may be in the early stages of a third wave down at four degrees. A third wave down may now be beginning at five degrees. Bitcoin may be still winding up for a spectacular plummet in price. The strongest fall may come towards the end of any one or more of these third waves as Bitcoin exhibits commodity like behaviour. Commodities tend to have their strongest portion of impulses in the fifth waves. The best fit channel has only weak technical significance. My alternate bullish wave count was discarded because the Forever trend line is properly breached and now has a successful backtest. I have again searched to find if a five down could be seen as complete. At this time, I cannot yet see either a complete impulse or a leading diagonal. 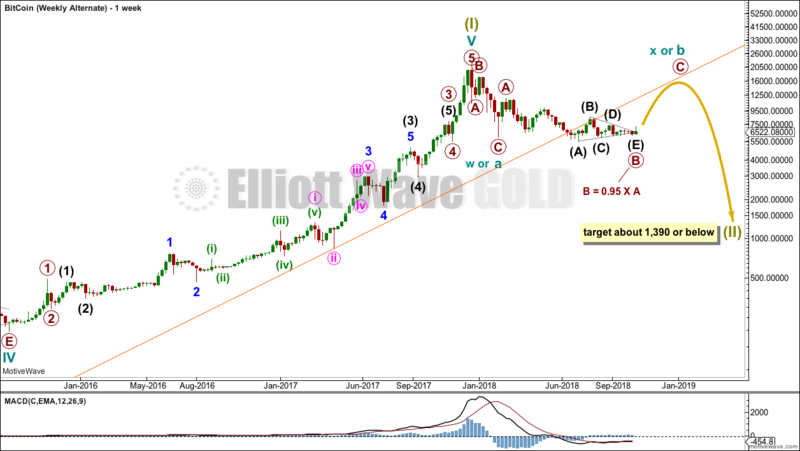 For the current fall in price, the current Elliott wave count expects the fall to be larger in terms of duration than the previous two noted here, and at least equivalent in terms of price movement in that a fall of over 90% is expected now. Currently, ADX is not yet extreme and RSI is not yet oversold. There is plenty of room for this downwards trend in Bitcoin to continue. Watch On Balance Volume carefully over the next couple of weeks or so. If it breaks out of the current range before price does, then it may signal the breakout direction for price. Both price and On Balance Volume are currently range bound. Published @ 05:25 a.m. EST. Bitcoin has moved sideways since last analysis. A third wave down may now be beginning at four degrees. Bitcoin may be still winding up for a spectacular plummet in price. The strongest fall may come towards the end of any one or more of these third waves as Bitcoin exhibits commodity like behaviour. Commodities tend to have their strongest portion of impulses in the fifth waves. The best fit channel was not perfectly showing where bounces found resistance, so it has been adjusted. This channel has only weak technical significance. My alternate bullish wave count is now discarded because the Forever trend line is properly breached and now has a successful backtest. Published @ 11:11 p.m. EST. Bitcoin has recently seen strong upwards movement along with increasing news coverage. A blowoff top may again be approaching. Will this herald just another interruption to Bitcoin’s upwards trend? Or could it be the end of this meteoric rise and the beginning of a larger fall? All charts are on a semi-log scale. The data for this wave count begins from June 2010. What looks like a five wave impulse may be completing. With no Fibonacci ratio between cycle waves III and I, it may be more likely that cycle wave V will exhibit a Fibonacci ratio to either of III or I. This movement does not fit well at all into a channel. – Bitcoin behaves like an extreme commodity. Its impulses have a curved look with slower second waves, quick fourth waves, and strong sharp fifth wave extensions. 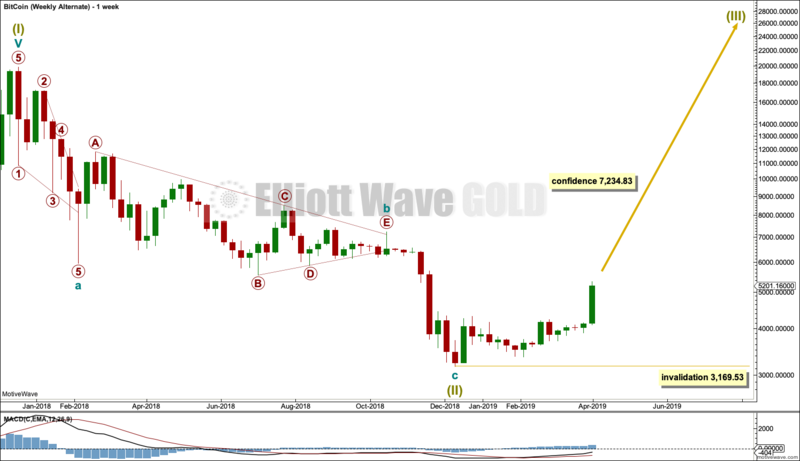 This tendency shows up in bullish and bearish waves. – Third waves are much longer than first waves, and fifth waves are longer still. Again, this is an extreme version of typical commodity behaviour. – The middle of its third waves may exhibit Fibonacci ratios within them, but overall it does not regularly exhibit good Fibonacci ratios. This would make target calculation particularly difficult. – Candlestick reversal patterns are common at the end of Bitcoin’s strong fifth waves. 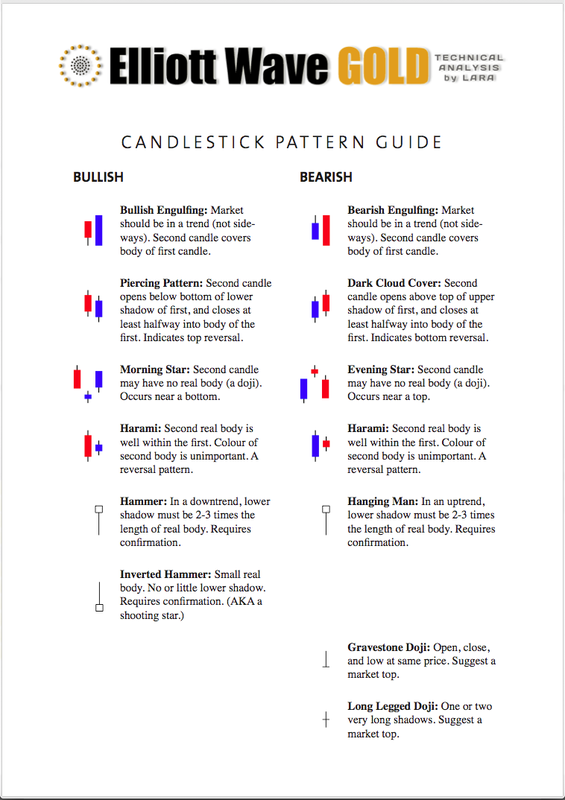 These are engulfing patterns or star patterns with very long wicks on the final candlestick. 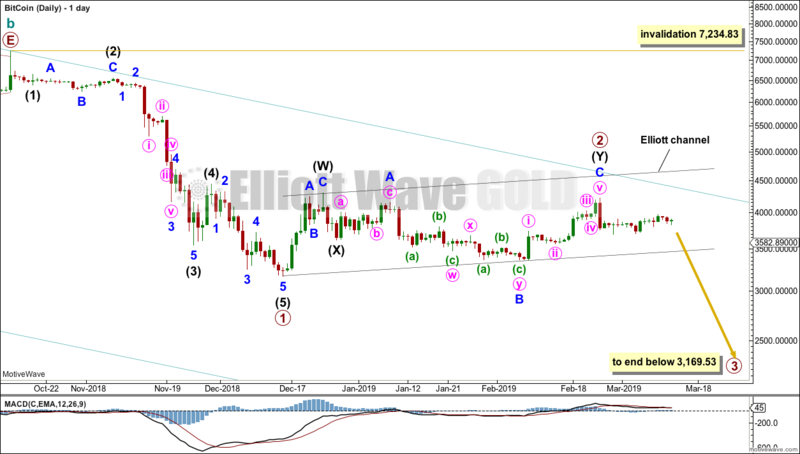 – Early second wave corrections are extremely deep, close to 0.8 and often deeper than 0.9 the depth of the prior first wave. 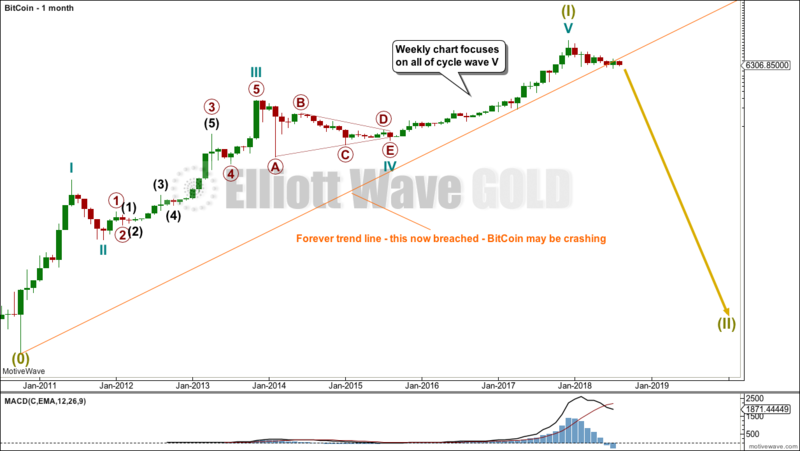 The weekly chart looks at the possible structure of cycle wave V, the final fifth wave. There are multiple ways to label this upwards movement. This is only one. 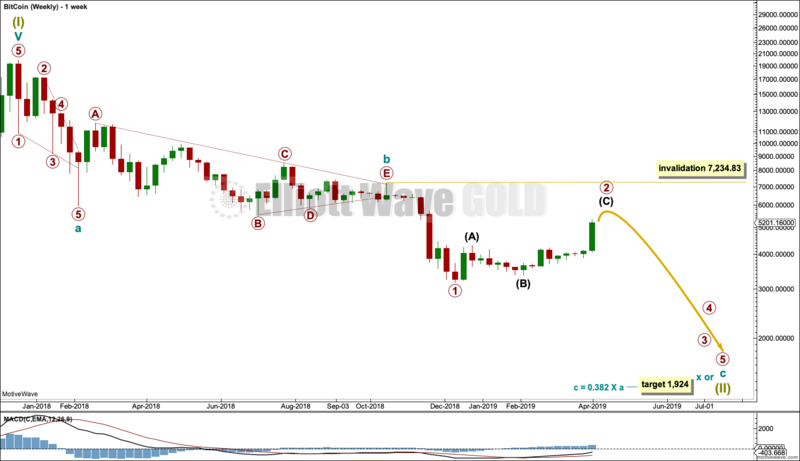 This daily chart looks at the final fifth wave of primary wave 5. Again, there are multiple ways to label this movement and this is only one of them. What cannot yet be seen is a candlestick reversal pattern at the high. A target is calculated at two degrees, which is a zone of only 32 bits. While this target looks reasonable, it must be acknowledged that given observed behaviour of this market it may well be too low if it is wrong. The bigger picture expects that Bitcoin may soon end its meteoric rise and turn to begin a very sharp and deep fall. When cycle wave V ends, it would complete one impulse up. Given this market’s tendency to very deep early second wave corrections, the resulting fall may be as deep as 0.9 of the prior rise. I will be following this market daily now to pinpoint when may be best to sell Bitcoins. 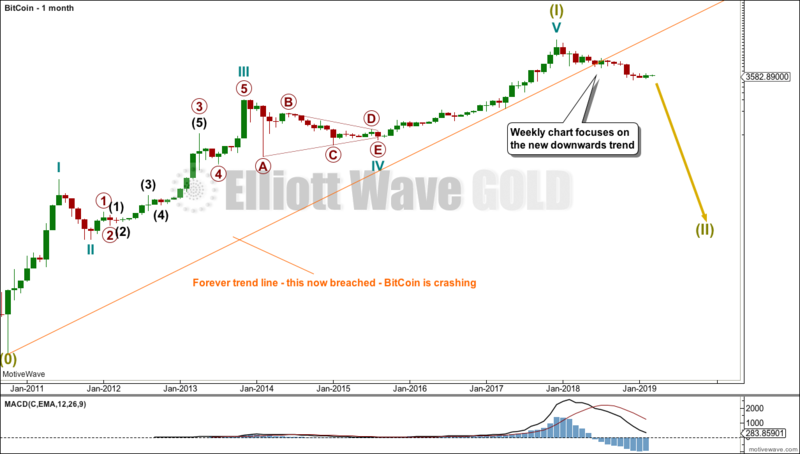 Thereafter, I will follow the big second wave correction to its completion in order to pinpoint when will be the best time to buy Bitcoins again. This analysis is published @ 07:16 p.m. EST.